Allisa James from DualShockers talks about the PS Vita TV and why it's actually a pretty good idea. I may very well import this thing just to have a "PS4" in the bedroom without buying a second one. That's actually a really good idea. It makes for a nice, casual console suited to a bedroom. Maybe I should consider doing that myself. its a definite buy absolutely imagine leaving your PS4 at home and remote playing it at your friends house with PsvitaTV thats amazing anyway you look at it. I don't think Sony should compete with the Apple TV. Apple's too popular for that. But if it does the same thing at the same price and more then why not? As long as they market the features well enough it could smash Apple TV out of the park. Apple TV isn't really that popular. 13 million sold overall, 6.5 million sold between June 2012 and June 2013. An income that Sony I'm sure would love. Those numbers just back up what I said, it's not that popular,especially considering the low price. If you add up annual sales of all such devices it's less than 10% of the annual TV sales, it's a huge untapped market that is still in the early stages. I see what you mean but it's still not an amount of money to be scoffed at. Hopefully Vita TV can move it from the early stages to a more mainstream device. 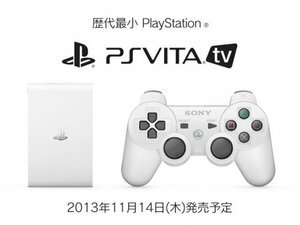 The name, being PSVita TV is really a good name for it, because it is a PSVita, it is using PSVita hardware. iT IS DESIGNED TO HOOK UPTO THE TV. the Playstation Icon what does it matter if they named the [email protected] thing Playstation Vita TV! its still a freaking Playstation! "I don't think Sony should compete with the Apple TV. Apple's too popular for that." its not that they want to, its that they have no other choice! i think many are not seeing that Sony has no other choice but to compete, because samsung , apple, LG, Panasonic Google. ETC. They are all already heading to this market, already Smartphone chips made by Arm Holding's are already going into TV's, topset boxes, what Main OS are these TV's and Smartphones and Tablets and Topset boxes are using? Android and iOS, Hell Sony is one of the founder's on the open handset alliance for a reason. they were already experienced such a disruption by smart devices when they made palm powered devices like the Cliq'. they know what's heading this way. why do you think the PSVita like the PSVita TV uses Arm Holding's chipset's, or that Sony purchsed Sony ericsson for 1.5 billion! or also made the Playstation Suite or as it's now playstation Mobile! other topset boxes, smartphones, tablets or smart TV's made by other companies can be income stream for sony also to sell playstation software on. streams for Microsoft for each PSVita, or PSVita TV user. All of your wall of text is beaten by the 3ds. Ios beats 3DS and GTA V beats Monster Hunter. Is there any point to this ? Do we make any money boasting this beat that, no and we never will. How you doing TongkatAli, life treating you good? How's the family? "All of your wall of text is beaten by the 3ds." So what if its beaten by the 3DS! that is aside the point, the point is unlike the 3DS while Nintendo makes another handheld , an it sales very well and the software is very good that does not take away from the fact, that the PSVita is not directed to the same market as what the 3DS is. while the next Nintendo handheld will be a good hand held no doubt, i also doubt very much it will have 128 MB of dedicated GPU ram in the handheld or a Quad Core GPU with hardware to go along with that. Nothing wrong with that, but that also shows you exactly what market both Nintendo and Sony are targeting. Nintendo's handhelds are not designed to take your living room console games on the go. IE: the same console game on your handheld. while Sony's is, that has always been Sony evolution for the playstation portable. Some may say wellwhat about exclusives, or that's why Nintendo is stomping the Playstation Brand. and Again So freaking what! it really does not matter one iota, because both are geared toward being the best platforms for what they are designed for, and both offer that in spades that no other companies have been able to really compete with. Right now the best game handhelds made for the consumer are made by Nintendo and Sony. Even Nvidia, and WikiPad and Archos Game pad still fall well short of both Sony and Nintendo, so its pretty much just two companies anyway. So really nintendo being in 1st place and Sony being in 2nd place is not going to matter what place they are in because they both pretty much have this market between them both of them to their selves. Microsoft does not even make a portable xbox so really who else is there? I love the 3DS, playing Project X Zone right now. Vita TV looks pretty cool too, nothing like another device to watch Netflix on. The more the merrier is what I say. The play PS4 thing is real nifty too. IMO it kills apple tv just because of all the extra hardware sony has on shelves to interact with this bad boy. i think sony is back in full swing now i realli hope they keep it up and stay throwing us all these goodies. To be fair, I think that they should just use the same Feb. date of the PS4 in Japan and bring it worldwide. That would allow consumers to get some extra money after purchasing a next-gen systems and give it some time to gain some traction in Japan. I think it's a fantastic addition to the Playstation stable of products, and I'll definitely be picking it up when/if it releases in Canada, but Sony is going to have to market this device properly. If PS4 emerges as the clear leader in the coming console gen, Sony needs to hammer home how the microconsole extends the feature set for both PS4 and PSVita. Tell PS4 and PSVita owners why buying this device would be a great idea. Advertisement will be key. People aren't going to buy it if they don't know it exists, what it does, and how it benefits them. Some misinformation in this article. FYI, all PS3s can play PS1 game discs. Huh? I never mentioned the PS3 in my article at all. "Currently I own a PS2, which lets me play the PSone games that I can’t play on my PS3." Now now, did you read the article you wrote? "Currently I own a PS2, which lets me play the PSone games that I can’t play on my PS3. " @AntsPai Wow, it's really sad that you even paid attention to that one line, when it barely relates to the article's point. Huh I guess I did mention it in passing. What an insignificant detail to even hone in on. Also, you're completely wrong. The first PS3 models had backwards compatibility but that feature was stripped not long after in order to reduce the price. The slim model that I currently own is no exception. Maybe you should have actually asked me what model PS3 I had before assuming that I was somehow lying about that. "ALL PLAYSTATION 3 SYSTEMS ARE COMPATIBLE WITH PLAYSTATION 1 GAMES"
Actually, ALL ps3 systems are backwards compatible with ps1 games. Only the ps2 backwards compatibility was removed, because the hardware version was too expensive, and the emulated version didn't work well enough. PS1 emulation works fine and does not increase the cost of the system, so it was never removed. My pc monitor sure can use an off white hybrid micro console as permanent companion. My my! PS-Plus sure is paying off nicely.